← Check out Blind Date with a book! 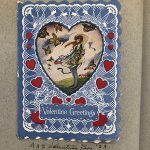 From the Archives & Special Collections: Happy Valentine’s Day! 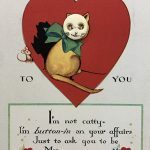 It is Valentine’s Day and there is plenty of love to be found in the Archives & Special Collections. 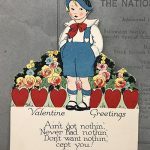 We love vintage Valentine’s Day cards and there are many fantastic examples in the scrapbook of Thelma Bestler. 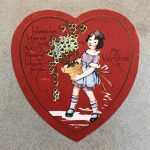 Bestler attended Puget Sound from 1920 to 1924 and her scrapbook contains an incredible amount of information about campus life during that time. She recorded information about her classes, teachers, university traditions, student clubs, and athletic teams. 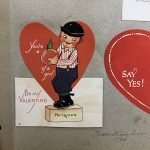 There are photographs and many pieces of ephemera in the scrapbook including dance cards, invitations, tickets, posters, newsclippings, and other items. Bestler majored in Home Economics and was involved in many activities on campus including the literary society known as Amphictyon, the Scienticians, and the Lamba Sigma Chi sorority. If you’d like to take a look at Thelma Bestler’s scrapbook yourself, please visit us during our open hours!